Northern Indiana is not known for its thriving culture or thrilling attractions. One of the major reasons my wife and I left the state was because of the mind-numbing wasteland it becomes in the winter, and the summer isn't much better for those not interested in outdoor sports. There's definitely still things to see and do, but it often requires looking a little deeper or searching a little further. While not as well-known as any attractions in Central Florida, the Fort Wayne Children's Zoo is also far better than just a hidden gem. It's one of the few genuine bright spots of the region, a moderately sized zoological park that still features a strong selection of animals and a constant drive to improve facilities. When I lived in Indiana, an annual membership was a necessity. I was determined to make a long awaited return to the zoo during my recent trip back to Indiana. The zoo itself hasn't changed much in the last few years, with most work focused on the central sections of the park. The central areas are the heart of the park, featuring some of the most popular animals like penguins and sea lions, as well as being the key to the zoo's layout. The zoo is a series of circular loops, with individual themed areas splitting off and circling back to the same main trail. This creates an easy to follow and logical path that eliminates most dead ends. 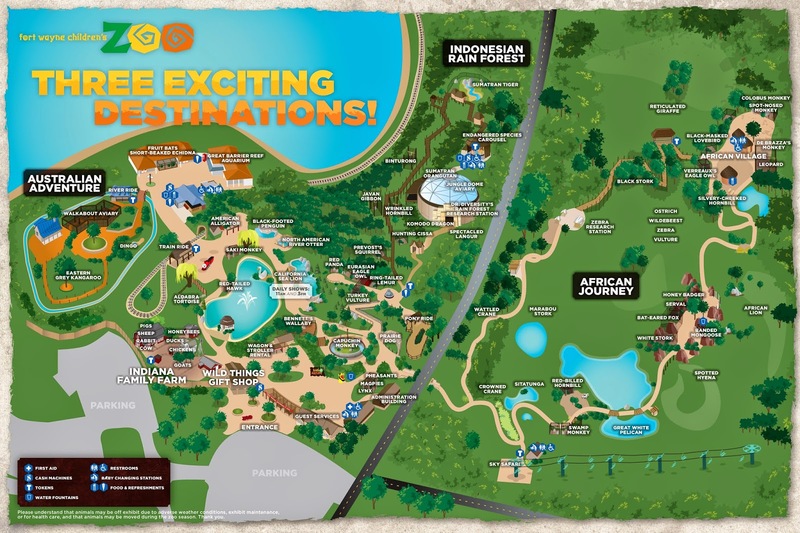 Going counter-clockwise, the first section most guests encounter is the African Journey. This area features animals found primarily in the savannah and desert areas of Africa, including wildebeest, lions, hyenas, and mongooses. The highlight is the giraffe feeding station, which allows guests to stand eye to eye and feed lettuce to those gentle giants. There's also a fun sky ride, though it's an extra charge and doesn't directly overlook any of the areas animal habitats. The next area is the Indonesian Rain Forest, which is technically the most outdated. It still provides some great environments, with the centerpiece being a domed jungle with separate organtuan habitat. There's also an elevated walkway through the trees outdoors with a new pair of Sumatran tigers and an endangered species themed carousel. The dome is starting to show its age, missing the bats, butterflies, and some of the birds from its earlier days, but it's still a stunning environment to experience. Last of the major lands is the Australian Adventure, which is currently experiencing a major renovation. Unfortunately, this means that some areas are currently not accessible or are unfinished, such as the former nocturnal animal building. The aqaurium is still accessible, however, as well as the outback aviary, kangaroos, dingoes, and popular log ride. Future plans show a lot of potential for the area, such as an interactive stringray pool and new reptile house, but it will be quite a while before everything is complete. In addition to the major lands, there's also a small family farm section with goat petting, train and pony rides, several counter service restaurants and a gift shop. The zoo took over concession operations from Dairy Queen in 2012, but it seems they still have some issues with efficiency and keeping up with demand. While the food isn't great, it's one of the few significant flaws of the experience. Even ostriches are trying to find their way to the zoo. The Fort Wayne Children's Zoo is a great attraction because it's just the right size. It manages to have a great variety of animals and interesting environments while still being a pleasant, walkable experience. There may be bigger, fancier, and more extravagant zoological experiences, but I'm still glad to visit the Fort Wayne Zoo whenever I get the chance. It will always feel like my home zoo. More pictures of some of the animals can be viewed below.